K'inich Janahb' Pakal, known today as Lord Pacal, sprang to renown with the opening of his pyramid tomb in 1952, revealing carvings which have become iconic among Mayan historians. His Temple of Inscriptions at Palenque was the culmination of an estimated 70 years of rulership. 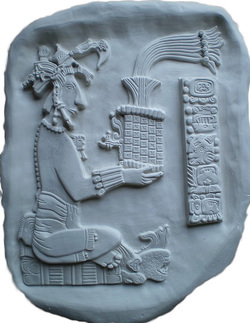 This carving is an extract of Stele 124, the 'Palace tablet', and shows Lord Pacal seated on one of the stones of creation while making a presentation of a headdress to his son, K'inich K'an Joy Chitam II (Kan Xul II). The stelae is from the Late Classical Period and dates to approximately AD 700. Quetzalcoatl, the 'Feathered Serpent', is among the most well-known of the Aztec gods, beloved for his benevolence and protection against the chaotic Tezcatlipoca. He was said to have brought civilisation to the Aztec people, although was eventually defeated in battle by Smoking Mirror and fled across the sea, promising to return. Many people link the coming of the Spanish Conquistadors to the Aztec's belief that their benign deity had kept his word, citing this as the reason the Spanish were initially welcomed with elaborate celebrations. This carving comes from the ancient capitol Tenochtitlan, now known as Mexico City. It is dated to AD 1519-1539 and is believed to have been carved to commemorate the rebuilding of the Great Temple. 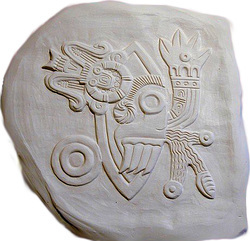 This head glyph, believed to represent the Mayan sun god K'inich Ajaw, is likely related to the 52-year cycle of the Mayan Calendar Round. He is shown here with his usual characteristics; being bearded, fanged, square-eyed and with the glyph for 'Day' (kin) upon his brow. Also displayed is a jaguar's ear at the back of his head, as he was believed to transform into a feline at the coming of night to travel through Xibalba, the land of the dead. 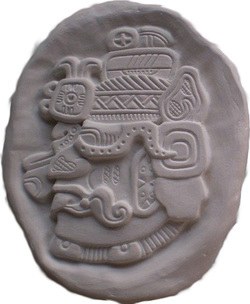 K'inich Ajaw was the patron deity of the day known as Muluc, day 9 of the 20 day week, and he was closely associated with warriors, rulers and jaguars. Originally a jade pectoral ornament unearthed in Nebaj, Guatemala, this carving is representative of the Mayan Classical Period (AD 250 - 900). It depicts the King leaning over and listening attentively to his dwarven courtier. Even continuing through to the Aztec times and noted by the Spanish Conquistadors, dwarves were recognised as frequent confidants to kings and noblemen. 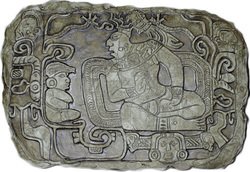 It has been theorised that the Mayans may have believed dwarves to possess magical powers or qualities relating to the earth and underword that were valued by the ruling class. These glyphs are a re-organisation of the lower half of the original coronation stone of Montezuma II, known popularly as the 'Stone of the Five Suns'. It is dated to AD 1503 and marks the ascension of the last crowned Aztec ruler before the Spanish conquest. The glyphs call upon the creative and destructive forces of the universe, embodied in various gods and natural elements. 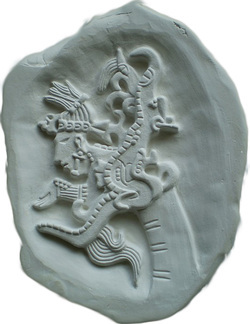 The two middle glyphs represent rain and power, the jaguar being associated with water since the time of the Olmecs. The cross at the apex refers to the end of the Fifth Age of the Sun through movement, and the lowest glyph gives the date of '11 Reed'. Fifteen years after this stone was carved the expansion of the Aztec culture was halted by the arrival of the Spanish Conquistadors, and the stone's prediction of catastrophe did indeed come to pass. This small hieroglyph carving was originally one of the glyphs seen on the Stone of the Five Suns (see above), which commemorates the coronation of Montezuma II while also making dire predictions of the end of the Fifth Age of the Sun. The god depicted in the glyph is Ehecatl, known as the god of the wind and one of the original creator deities. 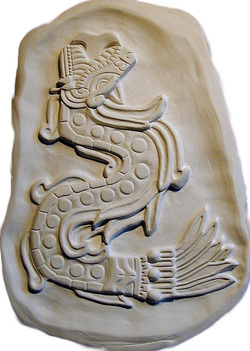 He is strongly associated with the Feathered Serpent, Quetzalcoatl. This calendar glyph represents a flint knife (Tecpatl), which was said to rule over both specific days and weeks of the Mayan calendars. These were thought to be times of particularly ill omen, ruled over by the chaotic gods Smoking Mirror and Jade Turkey. Ce Tecpatl was the birth date of the Aztec wargod, Huitzilopochtli, and on this day a great festival was held in his honour, presumably involving sacrifices dispatched with the Tecpatl knife. Also on this day in AD 1168, the Aztec people set out from their ancestral home to migrate to the area now known as Mexico City under the guidance of their god of war. This Aztec carving, dated to the 15th century, celebrates the birth of Quetzalcoatl, known as one of the Aztec's most benevolent gods. 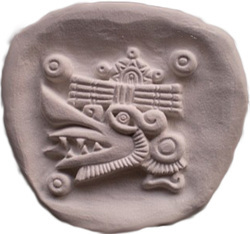 Quetzalcoatl is represented as the Feathered Serpent and as a sun god he was seen as the protector against the chaotic god, Tezcatlipoca (Smoking Mirror). He was instrumental in the creation of mankind as well as being responsible for introducing the concept of civilisation. Many variations of his birth exist both in art and literature, the most well-known being his virgin birth from a human mother by the name of Chimalman. This carving is likely a depiction of that divine birth myth. 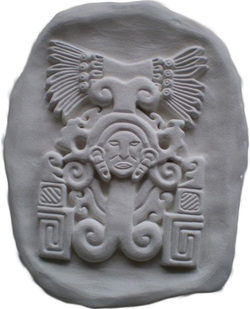 This carving, depicting Monument 19 from La Venta, is believed to be the earliest representations of Quetzalcoatl, the 'Feathered Serpent' god. 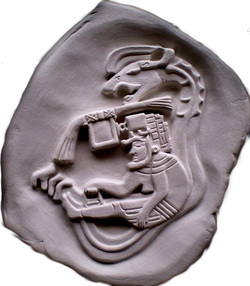 The human within his coils is alternately believed to either be a warrior or ballgame player undertaking a journey to the underworld by passage through the Path of the Feathered Serpent, or be the anthropomorphic embodiment of Quetzalcoatl himself. It dates from approximately 700-400 BC and is classed as an example of Middle Formative Olmec artwork. This carving is a reproduction of a wooden 'atlatl' spear-thrower on display in the British Museum. It is believed to date between AD 1325 - 1521 and due to the high level of intricacy and decoration of gold foil, it was most likely a ceremonial item rather than functional. Vision serpents are often depicted being summoned by kings and nobles during the Mayan self-sacrifice bloodletting rituals, whereby the supplicant's own blood would be sprinkled upon sacred paper that was then burned to produce the smoke from which the vision serpent would emerge. The serpent was seen as the means by which ancestors or deities could communicate directly with the living world, so the vision serpents are often depicted with a human head emerging from their open jaws, usually gesturing with a hand to indicate wisdom being bestowed.